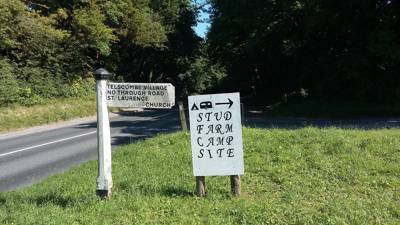 Framed by oak and ash trees and scented with the familiar smell of campfire smoke, Fontmills Farm is one of East Sussex’ most unassuming little campsites. 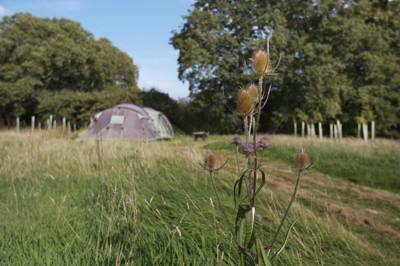 "Little" is perhaps misleading: The camping meadow is a pleasing 20 acres and part of a larger 140-acre farm, but Fontmills’ conscious restriction to maintain just 25 camping pitches means any large-scale feel is carefully avoided. Instead, the place is as uncommercial as they come, with only sheep as your neighbours, watching unobtrusively as you try to pitch your tent. Facilities are simple yet spotless, with a couple of hot, roof-less showers, four proper flushing loos, dish-washing sinks and a fridge-freezer anyone can use. 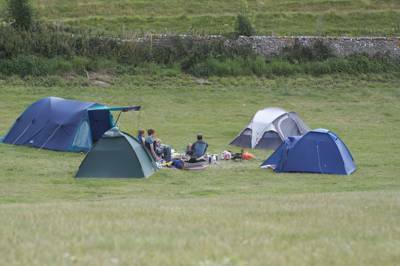 There’s also a clutch of furnished bell tents in one corner of the meadow, kitted out with memory-foam-mattress beds, rugs, lighting and, of course, colourful strings of bunting. 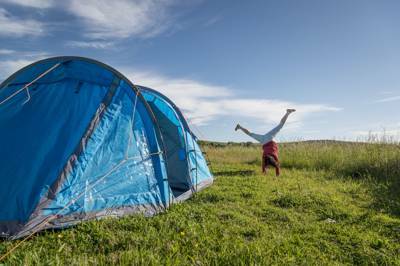 A box of kitchen wares will help you get cooking, with a gas stove supplied, though, like everyone else on the campsite, hiring firepits and cooking the old fashioned way is usually the most popular option. Logs are sold by the sack load, alongside free range eggs and seasonal vegetables. Hosts Steve and Nicola are long-standing owners of the farm and a well-spring of local knowledge. 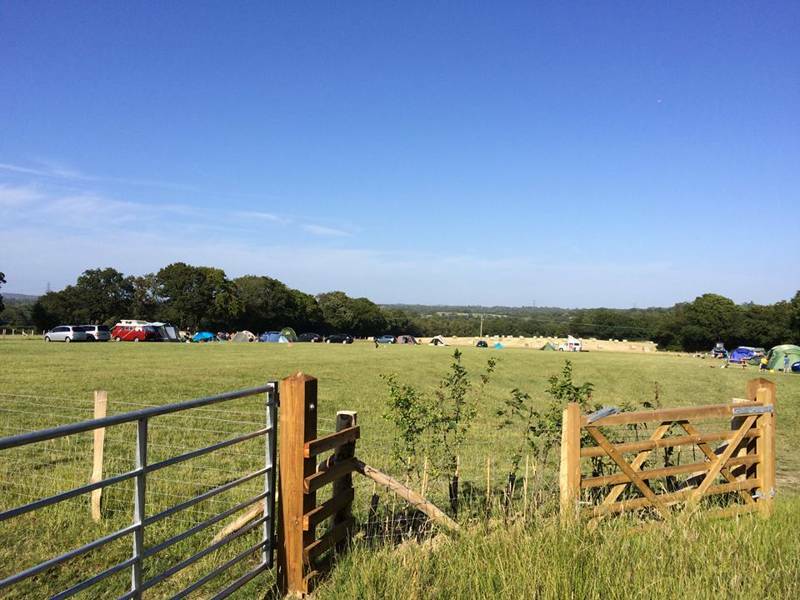 On arrival they’ll happily wave you into the field, where campers can drive to their pitch and make themselves at home before returning the car to a parking area. Those in the know will have brought bikes along for their stay too. A few hundred yards from the camping meadow, the renowned Cuckoo Trail is like a purpose-built, pub-to-pub pathway designed for the casual cyclist. In fact, it’s simply retracing the old railway line and much of what’s pedalled today is the same flattened route from the 19th century, just with the old sleepers and irons removed. Fontmills’ local sections are a flashing mix of green, tree-lined stretches and wide-open views across the quiet Cuckmere River. Not that you’ll have to pedal everywhere. It’s an easy drive to some of the main attractions, with the beaches of Eastbourne and the commanding white cliffs of the Sussex Heritage Coast just 20 minutes or so away. The nearby A267 leaves it all wonderfully accessible and whether you’re a culture vulture looking for Herstmonceux Castle and the 1066 trail or walkers with an eye on the nearby South Downs, Fontmills Farm is certainly a handy base. When you get back in the evening you still have the pleasures of an open campfire and wonderfully clear, starry skies. 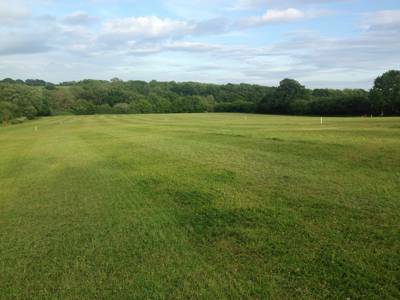 For latest availability and best prices for Fontmills Farm Campsite, please use the Date Search above. 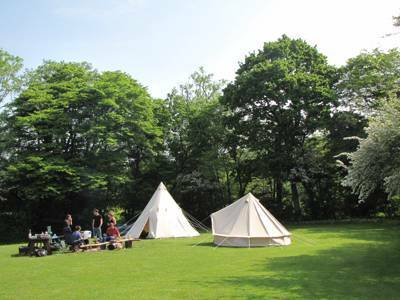 25 camping pitches and 4 fully furnished bell tents. 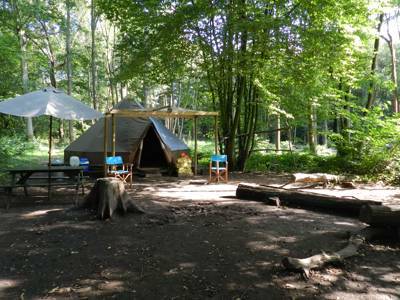 Each pitch has ample space for 6 people or so, with campfire pits available and logs to purchase from the farm. 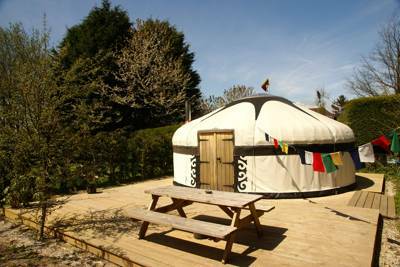 2 scenic outdoor showers, 4 flushing toilets, plus a separate washing up area for dishes with 2 large fridge/freezers. No WiFi, but decent 3G signal. 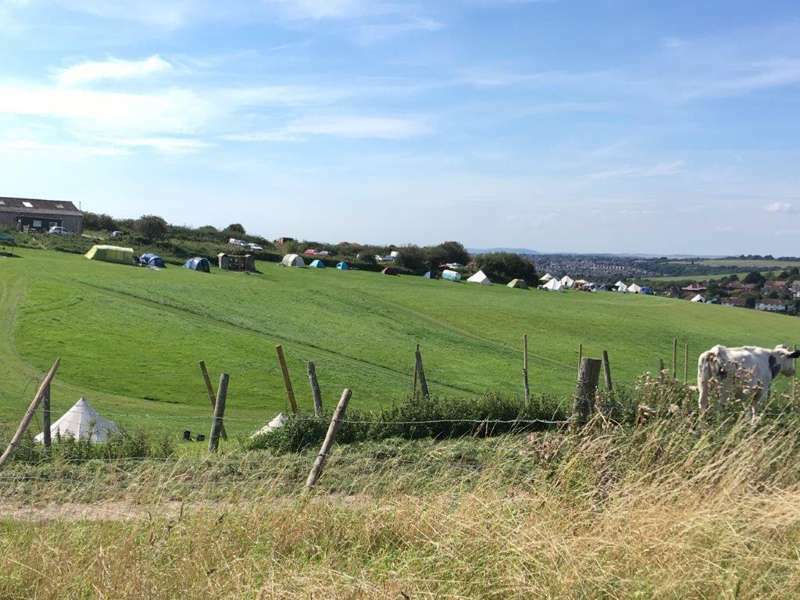 The campsite is located in a beautiful 20-acre meadow field amongst the wider 140-acre family farm, with blue texel ewes (with lambs every spring) in the neighbouring meadow. You can also walk or cycle the excellent and car-free Cuckoo Trail, 14 miles of old railway track between Heathfield and Polegate, that's located at the bottom of the farm. 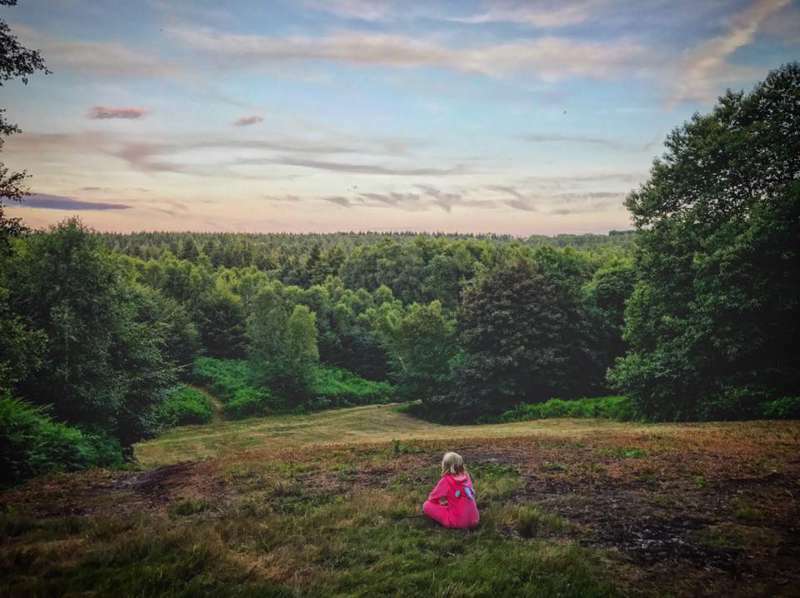 You don't have to stray far; Knockhatch Farm and Adventure Park (01323 442051) is just over 3 miles away – something to keep the kids entertained – and Blackberry Farm (01825 872912) is a great nearby family-run farm with lots of animals and café. The coast, though, is an obvious draw for many, with the famous white cliffs at The Seven Sisters Country Park (03456 080194) and Beachy Head just 25 minutes drive away. Plus don't miss Eastbourne's large and accessible beach. Back in land the South Downs (03003 031053) are even nearer and the beautiful village of Alfriston is a perfect place to visit and enjoy a pub lunch, while culture vultures will like Batemans (01435 882302), the former home of Rudyard Kipling and now a fascinating National Trust property along with 15th-century, moated Herstmonceux Castle (01323 833816); also the home of the Observatory Science Centre (01323 832731). Both are around a 20-minute drive. The nearest pub is The May Garland (01435 812249) at Horam, a traditional, family-run spot that's a five minute drive away. There is also an excellent fish and chip shop (01435 812624) in the same village. Perhaps a bit more legendary is The Six Bells (01825 872227) at Chiddingly (10 mins), they offer hearty pub-grub, a never-ending supply of beer and have live bands every weekend. The Plough (01323 844859) at Upper Dicker has an extensive menu and cosy, relaxed atmosphere, while The Gun (01825 872361) at Chiddingly is a classic pub with a country garden and panelled dining room – great for local ales. Both are 10 minutes drive from the campsite. On the third Saturday of every month Heathfield Farmer’s Market is the perfect place to buy fresh local produce, fruit, veg and meat (10 minute drive). If you’re looking for a large supermarket, Sainsburys and the Co-op can be found in Heathfield, whilst Hailsham has a Waitrose, Tesco and Asda. Adults £10; children (5–16 yrs) £5; under-5s free. 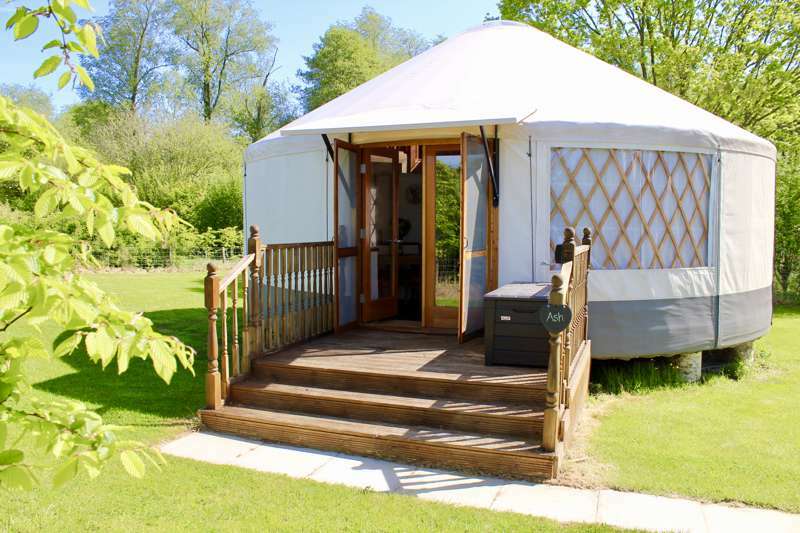 Furnished bell tents from £70 per night. The nearest train station is Polegate (0845 748 4950; Southern Railway).